For this month's SRC reveal, I was assigned Anna's blog, Cheese with Noodles. I love that name. It combines two of my favourite foods. Anna sounds like someone I could be great friends with. Apart from cooking up really yummy food, she loves indulging in her crafty hobbies like crochet, which we have in common and sewing, which I'm hoping to spend more time on soon. We share the love of gardening too. And she lives is Alaska. Oh how could I forget her pets - she has bunnies, cats and dogs, which could only mean that she is a super busy woman. While looking for a recipe to make for this month's reveal, I narrowed it down to her Buttermilk Cheddar Chive Bread, a very interesting Fruit Pizza, these droolworthy Garlicky Bacon & Cheddar stuffed Burgers and this refreshing Greek Pasta Salad. 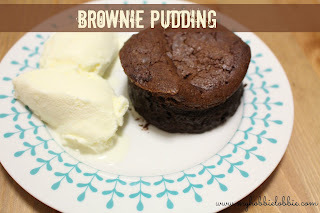 However, when I saw this Brownie Pudding post, my mind was made up. I love pudding and I love Brownies, so I new I had to try this Brownie Pudding. It was easy to put together and requires just a few pantry staples. My favourite part of this recipe was not having to wait for it to cool down. You can enjoy it warm with some Vanilla ice-cream, which is exactly what we did. These puddings have the most delicious crusty top that is beautifully chewy and a warm, gooey centre, perfection. 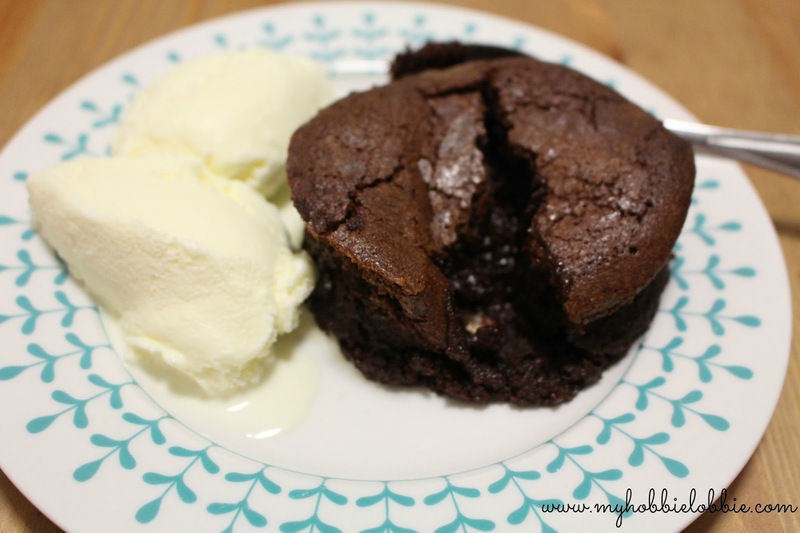 I was thrilled, because until today I'd only seen gooey centres on the television and here I was sitting with an individual pudding with the perfect gooey centre. Thanks Anna for a lovely recipe. I stuck to the original recipe, only I made them in individual ramekins and I agree with her on the portions. I made 3 individual portions, but 4 would have been much better. That's just something I'll have to make note of for when I make this again. Grease 3 individual ramekin bowls and set aside. Beat the eggs and sugar, till thick and creamy, light yellow. Add this to the eggs and sugar mix and mix together until combined. Add the melted, cooled butter and again mix until just combined. 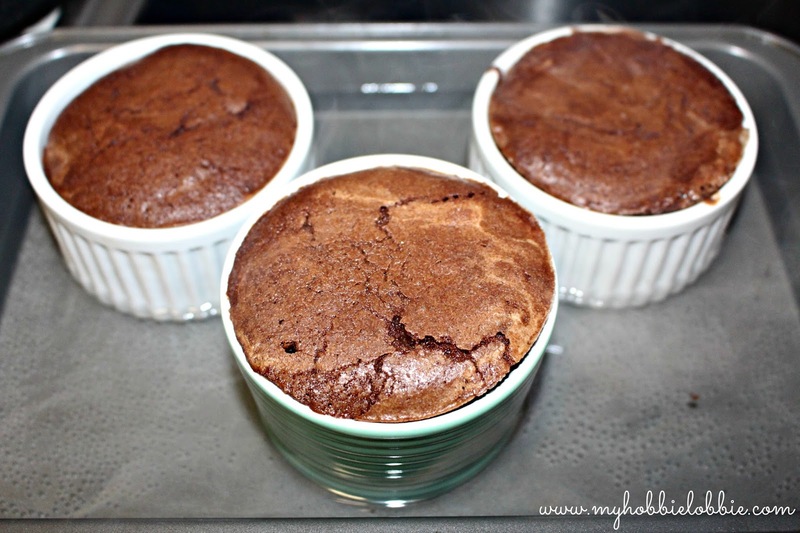 Pour the batter into prepared ramekin bowls or a larger bowl that has been greased. Carefully place in the oven and bake for about 45 minutes if you are making one large bowl. If you are making individual portions, like I did, bake for about 30-35 minutes. Test by inserting a toothpick near the edge of the bowl. When it comes out mostly clean it is done. Don't overbake as you want to have the middle a little gooey. Let it cool for about 15-20 minutes and serve with vanilla ice-cream, if desired. Oh, yum!!! They sound fantastic! You are the sweetest Erin ... thanks for stopping by! Its is soooo good Anna. Again thanks for sharing such a great treat. Looks gorgeous - on such a pretty plate too! Yes, please! This looks fantastic!